Bats use echolocation, or biological sonar, to make an auditory picture of their environment when foraging and avoiding obstacles in flight (1). To echolocate, bats emit a loud, high-pitched sound using their mouth or nose. The sound bounces off an object and returns to the bat as an echo, providing each individual with information about the object characteristics and location. While echolocation allows for the detection and discrimination of targets, the high-pitched frequency sounds that bats emit when echolocating provide a limited range of information (2). Despite being known for flying at night, some bats spend only a part of their time flying in complete darkness, suggesting that they may also rely on vision to supplement their echolocation in environments that have more light (2, 3). Previous studies have demonstrated that vision in bats influences flight behavior, which suggests bats may combine vision and echolocation to sense their environment (2). It is, therefore, accepted that bats are not blind, as the common phrase suggests, but little is known about how vision influences the way bats use echolocation. Figure 1. 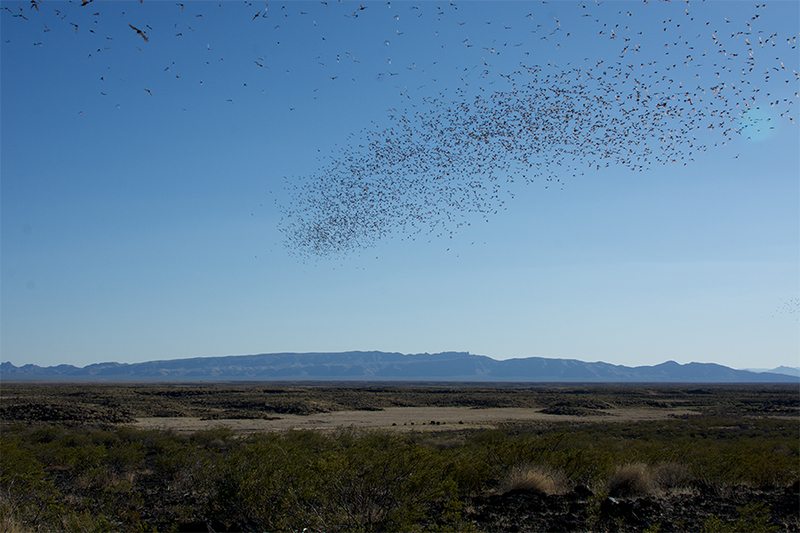 Swarm of Brazilian free-tailed bats flying during daylight hours after emergence. The Brazilian free-tailed bat migrates annually from Mexico to form large maternal colonies in caves in the Southwestern United States (2). These bats forage for insects in flight and emerge from the cave in groups of thousands for nightly foraging. The bats return to the cave in the early hours of the morning, requiring them to navigate back to their complex cave environment across a vast, open landscape. This reentry occurs across periods of complete darkness as well as early morning hours when ambient light is present. This suggests that bats have the option of using both echolocation and visual cues to navigate their environment in hours of daylight. Our research addresses how bats change their echolocation calls from an open environment to the more complex cave edge environment, and how the presence of daylight may influence their level of echolocation when accomplishing this feat. Figure 2. 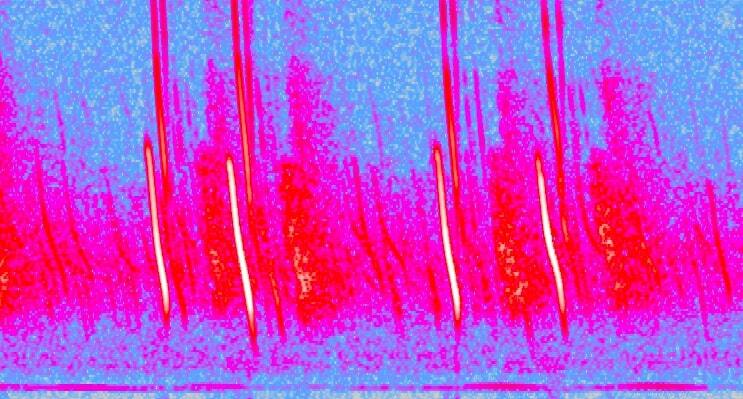 Spectrogram image of a sequence of bat echolocation calls recorded at the cave environment. Compared to the calls used over a vast landscape, bats at the cave edge used more complex calls that gathered more precise information about that environment. During hours of daylight, however, these calls collected less precise information than hours of darkness. As less information was gathered acoustically by bats during daylight hours, it is likely that bats are getting information from visual cues once daybreak occurs. This supplementing of vision for echolocation indicates that despite what the phrases say, bats are not blind. Video 1. Bats emerging for foraging during early dusk. Moss, C. F., & Surlykke, A. 2010. Probing the natural scene by echolocation in bats. Frontiers in Behavioral Neuroscience 4: 33. Mistry, S. 1990. Characteristics of the visually guided escape response of the Mexican free-tailed bat Tadarida Brasiliensis Animal Behavior 39: 314-320. Davis, W.H., Barbour, R.W. 1965. The use of vision in flight by the bat Myotis sodalis. The American Midland Naturalist 74: 497–499.